Looking for the best Moonshine around? This hooch may be legal, but it sure ain't refined! If you're looking for the White Dog, you've come to the right place. Right here is the largest selection of white whiskey in town. 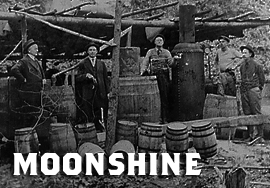 Moonshine has made a resurgence as of late and it's worth giving a try if you haven't already. The product is put through the still just like whiskey, but rather than aging the whiskey in barrels, it's put right into the bottle for your enjoyment. White, no char or oak but lots of flavor. Some's even got some flavorin'- Hot Damn!